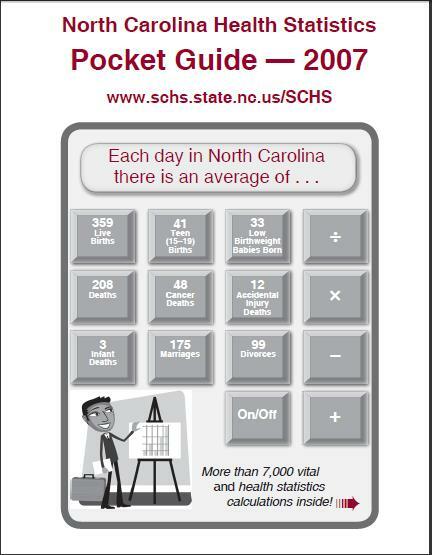 This week we are highlighting the North Carolina Health Statistics Pocket Guide, published biennially by the State Center for Health Statistics at the North Carolina Department of Health and Human Services. Use this resource to quickly find demographic data on North Carolina’s citizens; morbidity and mortality data; numbers on available healthcare resources; birth rates; and data on pregnancy outcomes. This important state publication — a concise statistical abstract of the health of North Carolina’s citizens — can be found here where it can be downloaded, printed, and/or saved for free. « Picture of the Week: Betty Jean is Ready for School!